A pizza is a round, open pie made with yeast dough and topped with tomato sauce, cheese, and a variety of other ingredients. Flatbreads or rounds of dough with various toppings can be found throughout the history of civilization. What is known as pizza today can be traced to Naples, Italy in the Middle Ages. The Italians are also credited with coining the term pizza, although its origin is not clear. It could have derived from the Italian word for point, pizziare, meaning to pinch or pluck, or a verb meaning to sting or to season. Early toppings may have included cheeses, dates, herbs, olive oil, and honey. Tomatoes or tomato sauce were not introduced until the sixteenth century when New World explorers brought the red fruit back from South America. The wealthy classes regarded the tomato as a fruit to be avoided; indeed many thought it to be poisonous. But in the peasant neighborhoods of Naples, residents were enjoying it with the rounds of dough that constituted their primary staple. Somehow the news of this tomato pie spread, and open-air pizza parlors began to do a brisk business. It was also not unusual to see the pizza marker, or pizzaioli plying his wares through the streets. Just as the tomato made its way to Europe, the pizza traveled to the United States with the large influx of Italian immigrants in the latter part of the nineteenth century. One of the earliest known pizzerias was opened by Gennaro Lombardi in New York City in 1905. The thin-crust pie served featured a layer of tomato puree, mozzarella cheese, and various toppings such as sausage and pepperoni. In 1943, Ike Sewell created a deep-dish version at his Chicago restaurant, Pizzeria Uno. The deep-dish pizza combines the sausage, pepperoni, mushrooms, and such with the cheese, which is then poured into a high-sided crust. A layer of tomato sauce is then ladled over the top. By the end of the 1940s, Frank A. Fiorello was packaging and marketing the first commercial pizza mix. Frozen pizzas were introduced in 1957. By the 1990s, one out of every 20 meals eaten American homes each week was pizza. From its humble beginnings as a staple of the peasant diet, pizzas now sport everything from shrimp to pineapples to barbecued chicken. The manufacturing process, however, remains virtually the same. Flour is ground from grain. All grains are composed of three parts: bran (the hard outer layer), germ (the reproductive component), and endosperm (the soft inner core). All three parts are ground together to make whole wheat flour. To make white flour, the bran and the germ must be removed. Since bran and germ contain much of the nutrients in grain, the white flour is often "enriched" with vitamins and minerals. Some white flour has also been fortified with fiber and calcium. Yeast is a single-celled fungus. The variety Sacchromycetais cerevisae is cultivated for use in fermentation to produce alcoholic beverages and bread. Yeast enzymes allow its cells to extract oxygen from the starch in flour and produce carbon dioxide. The carbon dioxide then causes the flour to rise. The dough must be kneaded for about 10 minutes until it is allowed to rise. Baker's yeast is sold fresh in cakes or dried in powder form. Mozzarella cheese was originally made from buffaloes' milk. In the Italian regions of Latium and Campania, it is still made this way, but the vast majority of mozzarella cheese is now made from cows' milk. It is stored in salted water or whey to keep it moist. For use as a pizza topping, the mozzarella is shredded. Pizza sauce is made from pureed tomatoes seasoned with a variety of spices including garlic, oregano, marjoram, and basil. Both fresh and dried spices can be used. The preparation of olive oil is as old as, if not older, than the that of pizza. Olives are gathered from orchards of olive trees and pressed to release their oil. The list of pizza toppings is exhaustive. Meats include sausage, pepperoni, bacon, chicken, and pork. Vegetables include mushrooms, spinach, olives, broccoli, onions, green peppers, and artichokes. Some of the toppings may be partially cooked before being added to the pizza. 1 A small amount of baker's yeast, about 1 tbsp, is mixed with a cup or so of warm water. It is left in a warm place until the mixture becomes foamy. 2 Several cups of sifted flour are poured into a bowl. The yeast and water mixture along with 1 tbsp of olive oil is poured into a well made in the center of the flour. The liquids are mixed into the flour with the hands and then kneaded on a floured surface until smooth and elastic. The kneading time is approximately 10 minutes. 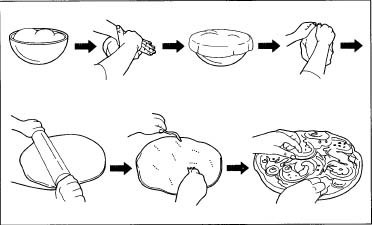 3 The kneaded dough is formed into a ball, dusted with flour and then placed in a bowl and covered with a damp kitchen towel. The bowl is placed in a warm place until the dough has doubled in size. This occurs in approximately one to two hours. 4 The dough is kneaded again for about one minute and then rolled out onto a floured surface into a circle. The standard pizza is approximately 10 in (25 cm) in diameter. The edges of the circle are raised by pushing up on the dough with the thumbs. 5 A half cup or so of tomato sauce is spooned over the pizza dough. The sauce is spread over the surface of the pie to within 0.5 in (1.3 cm) of the rim. The shredded cheese may be added before the toppings or on top of them. 6 Using a wide metal pizza peel, a long-handled flat shovel, the pizza is eased onto a metal pan or clay stone. Pizza pans feature a flat, circular bottom set into a round metal frame. After the pizza is baked, the outer frame is removed. Pizza stones are made of a clay similar to that of old-fashioned brick ovens. Because the clay is porous, it absorbs moisture. The thickness of the stone, usually about 0.75 in (2 cm), radiates heat evenly. 7 The pizza is baked at 450°F (230°C) for about 15 minutes or until the cheese is bubbling. The pan or stone is removed from the oven with the peel. The pizza is allowed to sit for approximately five minutes before cutting it into slices with a pizza wheel. Slice shapes, like the placement of the mozzarella cheese, differs from region to region. In some cities the pizza is sliced into pie-shaped pieces. In other cities, the pie is cut into squares. A staple since the beginning of human civilization, the pizza shows no sign of diminishing in popularity. So-called gourmet pizzas, made with pastry dough, goat cheese, and escargot, can be found on the menus of upscale restaurants. And in spite of increased awareness about cholesterol levels and fat content, a slice of pizza oozing with cheese and pepperoni is a favorite item in storefront pizzerias and shopping mall food courts. Anderson, Kenneth N., and Lois E. Anderson. The International Dictionary of Food & Nutrition. New York: John Wiley & Sons, 1993. Lang, Jenifer Harvey, ed. Larousse Gastronomique. New York: Crown Publishers, 1998. Scicolone, Charles, and Michela Sciolone. Pizza: Any Way You Slice It. Broadway Books. Stradley, Linda. "History and Legends of Pizza." What's Cooking America Web Page. 2000. December 2001. < http://www.geocities.com/familysecrets/History/Pizza/PizzaHistory.htm >.